American Made Fabricators solar division offers rooftop/ground solar mounting solutions for photovoltaic projects for all home, commercial, and utility buildings. Our pre-fabricated PV mounting brackets are expertly designed to withstand harsh weather conditions and provide reliable, sturdy mounting solutions for any number of PV projects. No two PV project sites are the same so American Made Fabricators solar division rooftop/ground solar mounts have been designed to be easily configurable and adaptable to fit almost any situation. 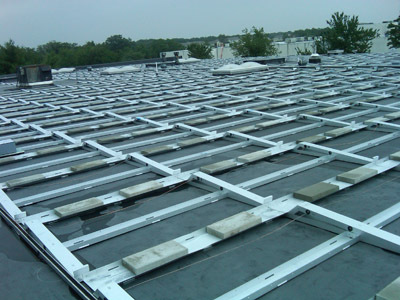 Rooftop solar mounts are engineered to overcome any weather condition found on rooftops and provide increased support without any negative effects on your building. Made from galvanized parts, our pre-assembled solar panel roof mounts offer easily configurable tilt angles to ensure your PV cells get maximum exposure to sunlight while maintaining stability. American Made Fabricators solar division ground solar mounts require no complicated assembly or fabrication for easy, ready mounting on almost any foundation. Our pre-fabricated ground solar mounts offer cost-effective, versatile, and reliable PV mounting solutions that save the resources and effort that can be spent elsewhere on a PV project. For more information on rooftop/ground solar mounts/brackets, contact American Made Fabricators solar division at (732)356-4306. The pre-assembled rooftop solar division systems are designed and manufactured to save up to 45% on service time.